Captain Eric Ha stares down his opponents from across the court as he is prepared to receive the ball. Ha shows off his skills as he swings and scores a point. Captain Kenny Nguyen picks up his racket and a tennis ball as he stands on the back line of the court. His brother stands on the upper half of the court, encouraging him. Kenny stares down his opponents, Diego Navarro and captain Eric Ha, as he throws the ball into the air and swings his racket to serve. 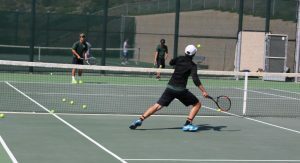 The boys tennis team may have moved down a division this year, but are coming out stronger than ever. Playing top teams last year left the team mostly with losses on their record, however, this new season has given Sage Creek a winning record. 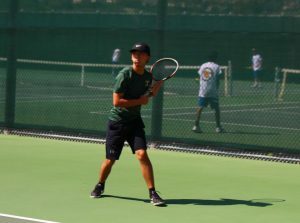 Tennis may be a game consisting of singles and doubles on the court, but what sets the Bobcats apart from other schools is creating a team atmosphere. 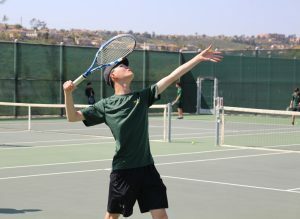 Sage Creek varsity tennis prepares for their game against Classical Academy. The players work as a team to prepare each other for game play. Nguyen, a senior captain on varsity this year, has been playing on the team for four years and has watched the players grow as a team. As the players accomplish new goals as a team, Nguyen has his own personal goals for the current season. It’s not just the seniors that are motivated to have their best season this year, but they inspire the underclassmen on varsity to be a better player and teammate. Kenny Nguyen lunges after a ball served by his opponent, Diego Navarro. Nguyen successfully hits the ball onto the other side of the court. The next generation of varsity players look up to the seniors as inspirations as advanced tennis players and as successful student-athletes. “Whenever I watch them I am just amazed at how good they are and it really makes me want to be better,” Darin Brion, a junior varsity player, said. Andy Goh prepares to serve to his opponents. As a strong server, Goh helps his teammates prepare for tough competition. Playing with experienced players can be intimidating to younger teammates, however, the seniors help to relieve the stress of the competition on the court. “I enjoy playing with people that are more experienced than I am because obviously they have a stronger skill set and it helps me improve my game more,” Jabari explained. The seniors may have only one season left with the Sage Creek team, but as they depart for college, the younger players will stay motivated to keep the spirit of the team alive on and off the court. “I feel like the seniors are very influential and very inspiring to the underclassmen and help them stay motivated and do their best,” Jabari said.